Studies associate the Mediterranean diet, rich in omega-3 fatty acids, olive oil, and antioxidant-rich fruits, vegetables, and herbs, with lowered cardiovascular risk and increased life span. Other studies support omega-3’s importance cardiovascular health. In fact, the FDA states that supportive but not conclusive research shows that consumption of EPA and DHA omega-3 fatty acids may reduce the risk of coronary heart disease. An enormous amount of scientific data documents the health risks associated with excess consumption of polyunsaturated fatty acids. While the polyunsaturated fats known as omega-6 fatty acids are essential to optimal health, most Americans and citizens of other Western nations consume far too many omega-6 polyunsaturated fatty acids and not enough omega-3 polyunsaturated fatty acids. The omega-3 fatty acids EPA (eicosapentanoic acid) and DHA (docosahexaenoic acid) are found in abundance in fatty fish and some marine mammals, as well as in the algae (seaweed) upon which they feed. Based on the multiple health effects of omega-3 fatty acids, including its effects on the heart, the importance of DHA and EPA cannot be overstated. Super Omega-3 EPA/DHA with Sesame Lignans & Olive Fruit Extract contains pharmaceutical-grade fish oil with a unique 35%/25% ratio of EPA/DHA. Research demonstrates that the addition of sesame lignans to fish oil enhances its beneficial effects. Sesame lignans inhibit an enzyme (delta-5-desaturase) that causes dietary fats to be converted into arachidonic acid, a precursor to the toxic inflammatory factors prostaglandin E2 and leukotriene B4. Polyphen-Oil Olive Fruit Extract is a proprietary, fortified extra virgin olive oil complex developed by Life Extension. The naturally occurring polyphenol antioxidants are typically lost in olive juice discarded during olive oil pressing. Polyphen-Oil is highly enriched oil with olive juice extract standardized with these naturally occurring antioxidants. The olive polyphenols in Polyphen-Oil help maintain normal LDL oxidation, suppress free radicals, and stabilize cell membranes. 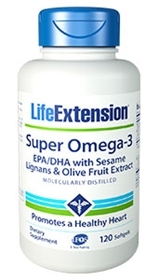 Only Life Extension’s Super Omega-3 EPA/DHA with Sesame Lignans & Olive Fruit Extract contains the "healthy trio" of concentrated nutrients from fish oil, sesame seed oil and extra virgin olive oil. Super Omega-3 EPA/DHA with Sesame Lignans & Olive Fruit Extract contains twice as much EPA and DHA as conventional fish oil capsules. Super Omega-3 EPA/DHA with Sesame Lignans & Olive Fruit Extract is certified to contain no detectable levels of mercury, arsenic, lead, cadmium, and other toxic metals by the International Fish Oil Society. This product meets or exceeds IFOS standards for PCBs, dioxins, and other contaminants. Other ingredients: refined fish oil concentrate (anchovy, sardine, mackerel), gelatin, glycerin, beeswax, soy lecithin, natural color, mixed tocopherols. Contains fish (anchovy, sardine, mackerel). Contains sesame. This product contains NO milk, egg, peanuts, crustacean shellfish (lobster, crab, shrimp), soybeans, tree nuts, wheat, yeast, gluten, corn, or rice. Contains NO sugar, and no artificial sweeteners, flavors, colors, or preservatives.